Biodiversity conservation, particularly on communal and rural farmlands, is still of a great concern in South Africa. This worry is further worsened with the different threats, ranging from deforestation and habitat fragmentation, encroachment, pollution, invasion of alien species, wildfires, logging, to hunting that communities pose to biodiversities on their lands. Agriculture emerges the greatest factor posing the most threats to biodiversity. Using this framework of interconnectedness between biodiversity and agriculture, this paper presents a philosophical argument exploring the role that agricultural extension can play to realise the goals of biodiversity conservation on South African communal and farm lands. Drawing on relevant published works, this paper argues that extension is particularly well positioned to address biodiversity conservation concern through the instruments of social mobilization, education, indigenous knowledge facilitation, linkages and ongoing advisory services. The importance of extending biodiversity conservation beyond the boundaries of the officially designated Protected Areas (PAs) has recently been recognized (Scoones, Melnyk, & Pretty, 1992; Halladay & Gilmour, 1995; Mc Neely, 1995). This thinking stems partly from the fact that PAs currently do not provide sufficient representations of the important biodiversity components that are worth being conserved (Margules & Pressey, 2000; Pressey, Wish, Barret & Watts, 2002; Rodrigues, Andelman, Bakarr, Boitani, Brooks, Cowling, Fishpool, Fonseca, Gaston, Hoffmann, Long, Marquet, Pilgrim, Pressey, Schipper, Sechrest, Stuart, Underhill, Waller, Watts &Yan, 2004; Chape, Harrison, Spalding & Lysenko, 2005), and also because of the threats posed to biodiversity both within and outside PAs (Hilton-Taylor, 2000). Establishing the urgent need for intervention, Hilton-Taylor indicates that some 25% of all mammals, 12% of birds, and 20-30% of reptiles and amphibians are at the moment endangered. Dissecting the threats faced by biodiversity in PAs, Carey, Dudley and Solton (2000) categorised them into four: (a) Individual elements removed from the protected area without alteration to the overall structure (e.g. animal species used as bush meat, exotic plants or over-fishing of specific species); (b) Overall impoverishment of the ecology of the protected area (e.g. through encroachment, long-term air pollution damage, or persistent poaching pressure); (c) Major conversion and land degradation (e.g. through removal of vegetative cover, construction of roads through protected areas, mining activities, etc. ); and (d) Isolation ofprotected areas (through major conversion of surrounding land). Outside PAs, the threats to biodiversity range from deforestation and habitat fragmentation, encroachment, pollution, invasion of alien species, wild fires, logging and hunting (Ervin 2003). All these are largely linked to agriculture (Millenium Ecosystem Assessment, 2005); hence the importance of considering what role can agricultural planners - particularly extension officers- play in the biodiversity conservation struggle. The contribution that agricultural extension can make in biodiversity conservation, to this extent, is rarely discussed and remains inadequately exploited. Although agricultural extension primarily focuses on enhancing agricultural production and improving rural livelihoods, international concerns around conservation suggest a re-evaluation and modification of agricultural extension models to suit the current global development and sustainability concerns. This paper, therefore, will explore this question by discussing South Africa's biodiversity and conservation profile, influence of agriculture (particularly smallholder agriculture) on biodiversity conservation, and agricultural extension paradigms. The paper will finally suggest ways that extension can synchronize the dual objectives of achieving agricultural development and biodiversity conservation by synthesizing the objectives of public agricultural extension with that of biodiversity conservation targets. South Africa is one of the countries that are highly endowed with biodiversity, with many species that do not exist anywhere else globally. The nation's biodiversity richness, comprising between 250000 and lmillion species, ranks the third in the world (World Conservation Monitoring Centre, 1992; Wynberg, 2002). South Africa also has a vast collection of landscapes and ecosystems that range from deserts to tropical forests, and huge varieties of marine and coastal bodies. The nation's biodiversity supports production of goods and services generally enjoyed by its populace including soil fertility, water, atmosphere, food, and many others (Shackleton, 2009 citing Scholes & Briggs, 2004). These resources contribute greatly to the country's economy (Twine, Moshe, Netshiluvhi, & Siphugu, 2003) and support the livelihood of several millions of South Africans (Wynberg, 2002; Twine, et al., 2003). At the same time, it is noteworthy that South Africa is also a home to most identified threatened biodiversity species the world over, having the highest concentration of many of them (Wynberg, 2002). While South Africa has several PAs covering approximately 6% of the national territory, these protected areas do not give adequate representation of the full range of the biodiversity types that demand conservation. For example, out of 441 vegetation types found in the country, 110 are not protected at all. In addition, for 90 vegetation types, less than 5% of the area they cover is protected; and for more than 300 vegetation types, less than half the area they cover is protected within statutory PAs (Botha, 2004). Furthermore, Botha notes that the absence of species needing protection in the nation's PAs is partly due to the threats that the PAs face from neighbouring communities; although these areas are protected, poaching still occurs. More importantly, some biodiversity needing conservation exist on communal lands that are located outside the boundaries of the designated PAs and are therefore completely without protection. In fact, the National Spatial Biodiversity Agency (NSBA) estimated that between 30-50% of the total communal lands in South Africa occur in priority areas for conservation (Botha, 2004). Accommodating these challenges, the conservation experience in South Africa has witnessed a major transformation from a strict protectionist approach towards one that accommodates sustainable uses of biodiversity resources and, inclusion of rural communities in decision-making on conservation of biodiversity that exist on their lands (Wynberg, 2002). In addition, to address these problems and related ones globally, there is a general agreement among the delegates that attended the recent 2003 World Parks Congress held in Durban, South Africa, that the global reserve system needs to be expanded to prevent further disappearance of endangered plants and animals. Indicating the alignment of South Africa with the rest of the world on this, the South African government emphasizes the earnest need of expanding biodiversity conservation beyond the officially designated PAs, and it makes efforts toward achieving this through its various Departments and Parks Boards (Botha, 2004). However, from research conducted in the South Africa's Eastern Cape, communal land owners do not prioritise conservation as they perceive that they do not derive direct benefits from biodiversity conservation on their lands. Given the existence of other income generating land uses, communal land owners usually choose those land uses ahead of biodiversity conservation. If this trend continues, then, biodiversity will continue to be threatened in the areas where it has great potential of existence. It follows, therefore, that identification of an appealing package of incentives derivable from biodiversity conservation and which can motivate communal land owners to adopt land use practices that are compatible with biodiversity conservation, becomes important (Abdu-Raheem, 2010). This paper suggests that, given the fact that they have vast knowledge of most values that appeal to communities and are equally close to scientific findings and researchers on biodiversity resources, promoting biodiversity conservation on communal land can and should be undertaken by the state agricultural extension services. Mitigating the threat of elimination of about a quarter of the total world's wild species and destruction of significant agro-biodiversity, while simultaneously seeking solutions to the plight of some 800 million people and 1.2 billion people that are suffering from undernourishment and living in abject poverty respectively, presents a difficult and daunting task (McNeely & Sherr, 2002). Achieving this goal requires a multidisciplinary approach (Wynberg, 2002). Agriculture, undoubtedly, serves as an overlapping meeting point between the two crystallised objectives of increasing food production and conserving biodiversity. Agricultural production accounts for 67% percent of land globally (Wood, Sebastian & Scherr) and has a range of associated ecological footprints (Scherr & McNeely, 2008). Furthermore, the use of land for agriculture may likely increase with time due to increasing demands for food as the current global human population is projected to increase to 7.2 billion, 8.3 billion and 9.3 billion by years 2015, 2030 and 2050 respectively (Cohen, 2003; FAO, 2003). Added to this ecological stress is the fact that over 1.1 billion people, most of whom are dependent on agriculture, reside within the locations of the 25 globally identified biodiversity hot spots (Cincotta & Engelman, 2000; Myers, Mittermeier, Mittermeier, da Fonseca & Kent, 2002). The influence of rural communities on biodiversity resources is receiving increased attention. This may be because of the wide range of uses (Shackleton, Shackleton, Buiten & Bird, 2007, citing Oksanen et al., 2003 and Lawes et al., 2004) to which rural people put biodiversity resources; or for the fact that biodiversity resources are most often located in rural and remote environments (Shackleton, Shackleton, Buiten & Bird, 2007). Underscoring the extent of interdependence between biodiversity and rural communities, Shackleton, Shackleton & Cousins, (2001) note that income from harvesting wild plant products, particularly in Southern African rural communities, accounts for up to nearly 50 per cent of these communities' total net incomes. Smallholder farmers are critical to achieving both food security and biodiversity conservation, particularly in the developing countries where 50% of the rural populations are smallholder farmers (UNCTAD, 2010). However, the success of these smallholder food producers depend greatly on increased productivities of land and other natural resources, market integration, technological innovation, human resource capital and social capital development (World Bank, 2006; Abdu-Raheem & Worth, 2011). An effective information system is of paramount importance to implementing a successful sustainable agriculture programme (Mazumadar, 2006) which requires reduced off-farm inputs and increased skills, labour and sound management practices to compensate for the reduced inputs (Cho & Boland, 2004). Allahyari (2009; citing Hersman, 2004) further notes that extension can provide the required information network. Extension's role in ensuring successful implementation of sustainable agriculture cannot be over-emphasised (World Bank, 2006; Ahmadvand & Karami, 2007). As South Africa becomes more conscious of the need to combat degradation and unsustainable exploitation of biodiversity species, particularly on communal lands where they mostly occur and are highly threatened, extension emerges as a potentially powerful vehicle to achieve this. This is evidenced through the skills and approaches that extension possesses and can use to create and enact necessary the instruments of change as may be required by sustainable agricultural practices. To understand what role agricultural extension can play in addressing South African biodiversity conservation concerns, it is useful to consider the general objectives and approaches of agricultural extension. Swanson (2009) identifies four categories or models of agricultural extension: technology transfer; advisory services; non-formal education; and facilitation extension. Groot and Roling (1998) described a similar range of extension approaches. Worth (2006) suggests a fifth approach: facilitated learning. Table 1 provides a brief comparison of four of these approaches using eight critical factors: purpose, assumptions, source of innovation, promoter's role, farmers' role, supply/demand, orientation and target. 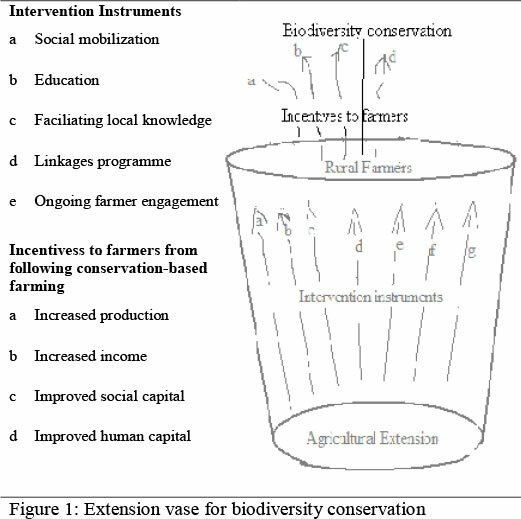 Figure 1 shows the intervention instruments available to agricultural extension to achieve biodiversity conservation, increased agricultural production, increased income, and improved social capital and human capital. The key instruments are social mobilization, education, indigenous knowledge facilitation, linkages and ongoing advisory services. With extension adopting social mobilization in the course of promoting sustainable agriculture among rural farming households, awareness of the new farming system is easily achieved in the community and adoption of the programme could better be guaranteed. Also, different groups- producer, marketing, credit and consumer- could be bought in into the programme. Gray, Phillips & Dunn (2000) indicate that landholders' decisions on land use depend greatly on the relationships among themselves and the general social context of the community in which decisions are being taken. With the creation of strong social capital within a community, communities stand a better chance of successfully adopting innovations at a general scale to achieve collective results and benefits (Serageldin & Grootaert, 2000; Pretty & Smith, 2004). Stanley, Clouston and Baker (undated) indicate that the collective resources pulled together in a community through exploitation of social capital, in the case of natural resource management, include physical resources, human resources and information resources. Ostrom and Ahn (2001) assert that the importance of social capital in solving problems which require collective action, particularly natural resource management, cannot be overemphasised. Among the many instruments, as indicated in figure 1, that can be used by extension to enhance the adoption of sustainable practices by smallholder farmers is education. Educational activities can be carried out through one or combination of the several extension methods of teaching, among which are: workshops, field trainings, field visits and demonstration. Pierotti and Wildcat (2000) note that substantial knowledge of an intervention and literacy influence the willingness of individual rural landholders to engage in collective action that will bring about collective gains. 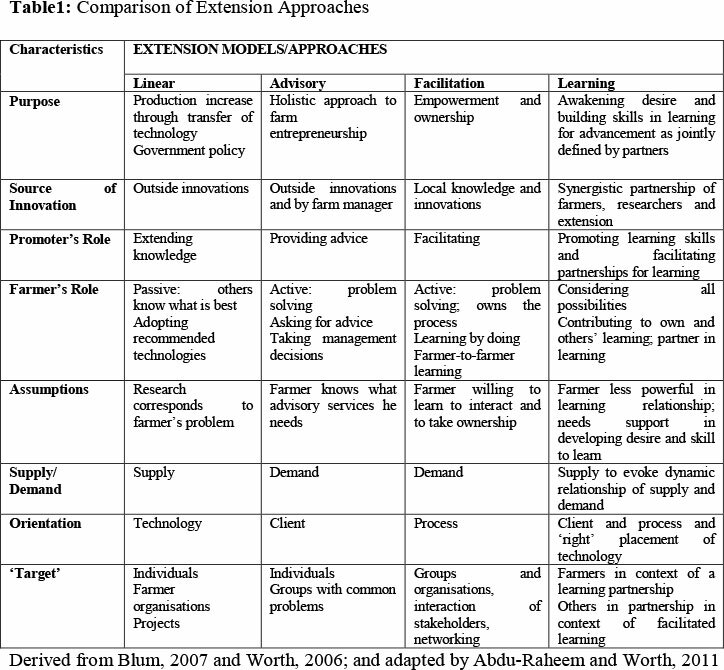 Abadi Ghandim and Pannell (1999) however note that adoption comes through a learning process that can be categorised into two phases: (a) collection, integration and evaluation of new information in order to make informed decision about a new innovation; and (b) improvement in the skills of landholders to better adapt the innovation to their local situation. The first phase indicates that landholders are mostly uncertain about the usefulness and benefits involved in new innovations; and as such, are reluctant to adopt it if at all they give it any consideration. However, with education, they are more informed and their uncertainties are reduced; thereby leading them to make informed decisions on the newly introduced innovation (Marra, Pannell & Abadi Ghandim, 2003). The second aspect of the learning process assumes that practical implementation of an innovation needs to be based on a degree of background knowledge about the innovation. However, the best-suited method of application of the innovation adaptable to the landholder's environment is only detectable through practice. Therefore, landholders gain higher degrees of knowledge with practical experiences. Worthy of mentioning is the indication made by Pretty and Smith (2004) that the farmer field schools for Rice management in Asia as an innovation has resulted in substantial reduction in the use of pesticides among farmers- about 2 million, 55,000 and 1 million in Vietnam, Sri Lanka and Indonesia respectively- in Asian countries. Various literature materials have identified the dynamism and stages involved in a learning process, among which are: Pannell, (1999), Barr and Cary (2000), Rogers (2003) and Pannell, Marshall, Barr, Curtis, Vanclay and Wilkinson (2006). As shown in Figure 1, extension can facilitate local knowledge to promote adoption of sustainable agricultural systems among rural farmers through education and indigenous knowledge facilitation. Stanley, et al. (undated) indicate that some landholders do not share consistent understandings on some uses of land with scientific claims. This is often due to contradicting experiences of landholders over time as against scientific claims. Richards, Lawrence and Kelly (2003) suggest that farmers' strong attachment to local knowledge and experiences influence farmers' decisions in adopting new scientific knowledge. Therefore, there is a strong need for extension practitioners to acknowledge local knowledge and make it a basis upon which new knowledge is to be based and improved. Stanley, et al. (undated, quoting Khanna, 2001) argues that lack of sufficient knowledge on the benefits of a particular technology had also been presented as the reason of non-adoption of such technologies by land managers. There is a serious need for extension practitioners to update the knowledge of landholders based on scientific developments in order to achieve improved production with minimum damage to the natural capital. Byron, Curtis & MacKay (2004) indicate that inaccessibility of landholders to professional advice on a particular technology constitutes a major constraint towards changing land management practices. Although there could be some resistance from landholders towards new technologies probably because of lack of knowledge about it (Stanley, et al., undated, quoting Khanna, 2001), Pannell, Marshall, Barr, Curtis, Vanclay & Wilkinson (2006) suggest that landholders confidence and probability of adoption of new technology increases with increasing knowledge and experience through practice. In order to achieve appreciable receptivity of new technology by landholders, extension practitioners need to provide landholders with accessibility to dependable, practical and understandable information, both on the problem to be tackled and the new technology being echoed for adoption (Lockie & Rockloff, 2004). Another instrument of extension through which sustainable agricultural system can be promoted among rural farmers is linkages. This implies that extension needs to assist rural landholders to set up a vertical integration with both downstream and upstream organisations and also to establish horizontal integration among people of different interest groups within the rural community in order to facilitate adoption and maximum return from sustainable agricultural systems being proposed. Swanson (2006) discussed linkages as being in association with building social capital simply for the fact that all the parties involved in the link can jointly work together to achieve a common goal or benefit. Putnam (2000) has adopted terminologies like "bonding" and "bridging" in the analysis of the identified linkages. "Bonding" which implies the creation of a network of people with a common vision and goal has been discussed earlier under the social capital instrument. However, the "bridging" type of social capital or linkage entails that extension creates linkages between rural landholders and outside groups or organisation for the purpose of achieving a common set of goals. For example, research bodies and input markets that sell inputs that comply with the objectives of sustainable agriculture can be linked up with rural farmers. Also, farmers can be linked with output markets that specially deal in the purchases of products from sustainable-compliant type of agricultural production. These linkages will help farmers to secure favourable deals with both the input and output markets; hence, being better encouraged in adopting the new technology of minimum disturbance to biodiversity. Swanson (2006:12) suggests that extension is well positioned to help farmers establish these linkages with relevant groups. He further suggests that this is best achieved through four ways: "helping farmers get organised"; "determining their interests based on accessible market opportunities"; "training these groups in how to produce specific crops/products" and "working with them to develop supply chains in marketing their products". The last instrument shown in Figure 1, through which extension can promote adoption of sustainable agricultural practices among rural farmers, is ongoing farmer engagement. As soon as a farmer adopts an innovation, he experiments with it, most often, on a small scale to see what effects and challenges would come up (Pannell, et al., 2006). With this, there is ongoing experimentation by the farmer to better adapt the innovation to his own situation. This gradually develops beyond the stage of little training and information provided by agricultural extension, to the degree of sustainable transformation and livelihood improvement (Sturdy, Jewitt & Lorentz, Undated).This suggests that landholder's confidence and probability of adoption of new technology increases with increasing knowledge and experience through practice. To achieve appreciable receptivity of new technology by landholders, therefore, extension practitioners need to provide landholders with accessibility to dependable, practical and understandable information, both on the problem to be tackled and the new technology being echoed for adoption (Lockie & Rockloff, 2004), as well as walking with the farmers through the early growing seasons, in which different challenges may be experienced from the adopted technology. This will boost the confidence of the adopting farmers in the technology as well as in the extension personnel; and, therefore, promote the atmosphere of further collaboration between the farmers and the extension officers. This paper has highlighted various means by which agricultural extension can help address promotion and adopting of sustainable agricultural practices by rural farmers so as to reduce the threats currently faced by biodiversity in rural communities. Its chief instruments of social mobilization, education, indigenous knowledge facilitation, linkages and ongoing advisory services are effective means of addressing biodiversity conservation concern at rural community level. The paper further demonstrates that, by extension focusing on enhancing sustainable agricultural practices through the named instruments, biodiversity conservation, increased agricultural production, increased income, and improved social capital and human capital can be improved. Thus, it is vital that agricultural extension remain an integral tool of any government's to address biodiversity conservation at the rural environment level. Whatever approach or combination of approaches used - technology transfer, advisory, facilitation, or learning - agricultural extension programmes should be re-examined and adjusted so that they are made to contribute to creating and maintaining food security and to alleviating poverty at the household level.